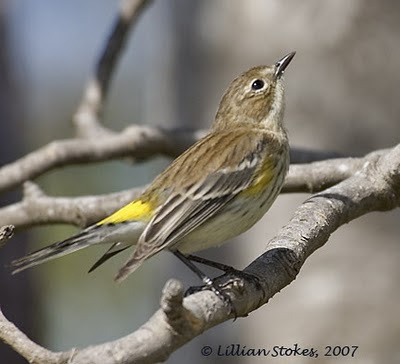 Yellow-rumped Warbler. The yellow rump is not always showing. This is one of the most abundant migrating warblers, learn it well. 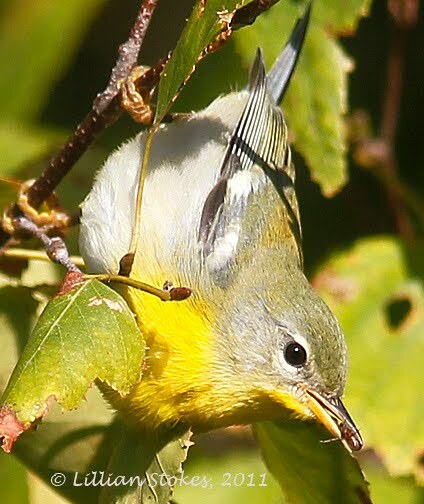 Northern Parula, Nashville, Yellow-rumped, Magnolia, Black-throated Green, and Orange-crowned Warblers and lots of Common Yellowthroats. Get your binos out, look in your yard, parks, woods, just about anywhere now for these jewels. 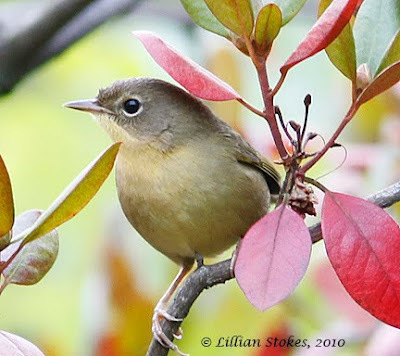 For ID help use our The Stokes Field Guide to the Birds of North America for the most complete photos and info., or, Stokes Field Guide to Warblers if you are an intermediate or beginner. 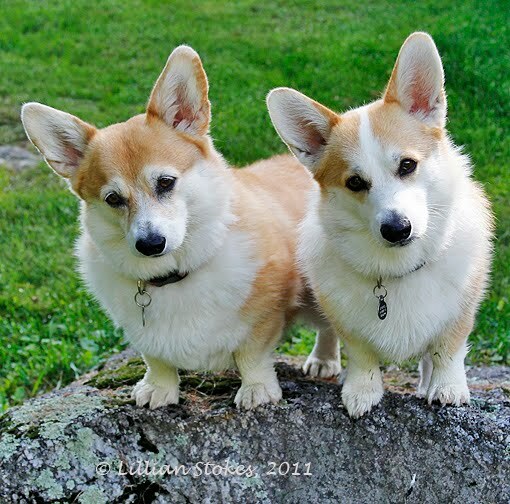 We own 2 Pembroke Welsh Corgis, Phoebe and Abby, and we adore them. 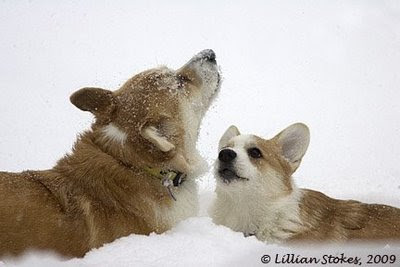 Abby's sister is the famous Bubbles who, recently, was runner up to the Best of Breed winner at the Pembroke Welsh Corgi Club of America National Specialty show, quite an honor. Congratulations to Bubbles and all the other winners at the show. 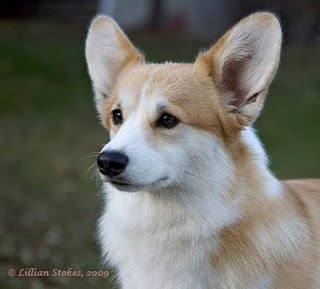 Bubbles has also recently won several regional Corgi specialty dog shows. She is only 3 years old and has a long show career ahead of her. I love taking photos of Corgis, as well as birds. 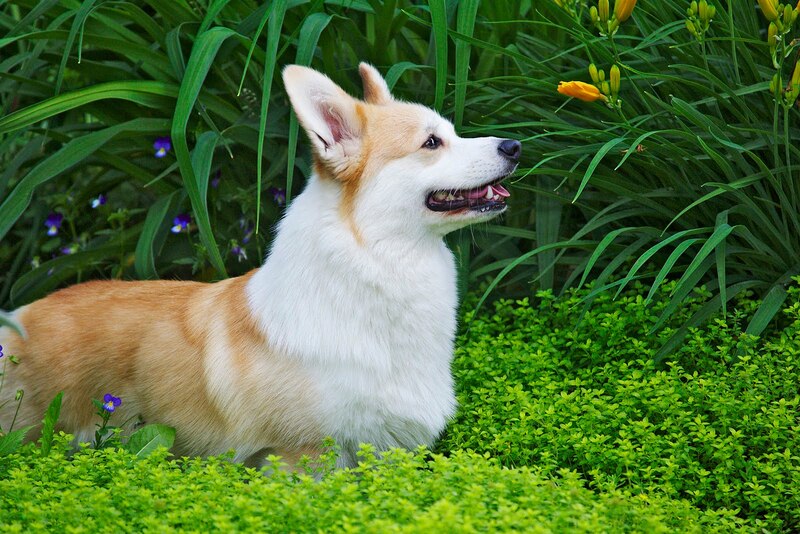 Bubbles is so photogenic and embodies Corgi beauty. Here is Bubbles and her sister Pearl as puppies. Pearl is also a show dog and almost has her championship. 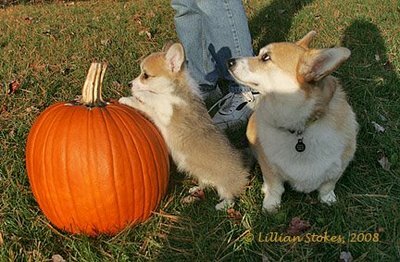 Phoebe is showing puppy Bubbles all about pumpkins. 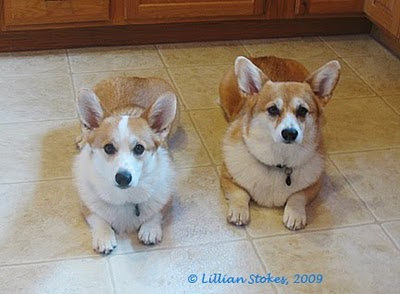 Our Corgis, Phoebe (the lawyer), left, and Abby (the party planner), right. Phoebe is cousin to Bubbles and Abby. Abby is litter sister to Bubbles and Pearl. We were fortunate to get these beautiful Corgis, who have great temperaments, from Dianne Connolly's Llandian kennel. 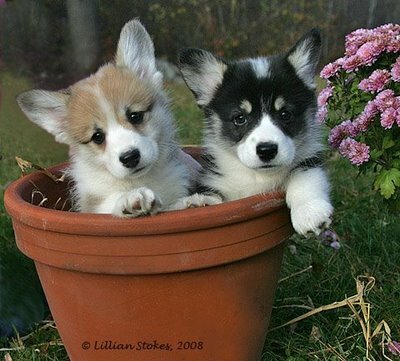 Tip: if you want a Corgi get one from a reputable breeder from the PWCCA. We got Abby at 10 weeks of age and she has always looked up to Phoebe as top dog and her mentor. Hummingbirds are migrating and many Ruby-throated Hummingbirds have left New England and are on their way south and out of the U.S. Many western hummingbirds are also migrating and will leave the country for the winter. 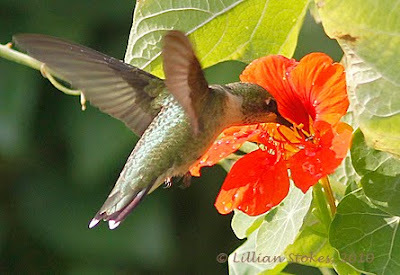 I took this photo of a Ruby-throated Hummingbird recently in my veggie garden, sipping a nasturtium. It was magic. The hummingbird was lit in the early morning sun. Not an easy shot to get, as it was flying freely, and only hovering for seconds at the flowers. What I like about this is that it captures a wild moment in natural light. 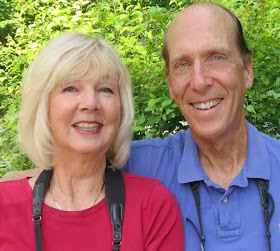 Most hummingbirds have left NH, where we live, by now. 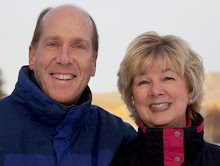 We will miss them. 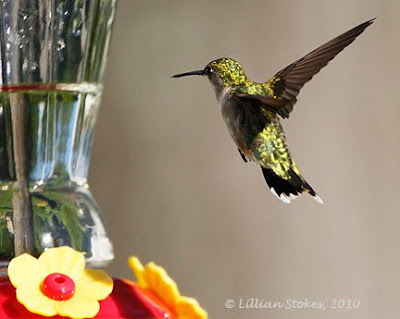 We will miss on of the favorite ways we get to be with hummingbirds, and that is watching them come to our hummingbird feeders which we place within 10 feet of our chairs on the deck. We can hear the buzz of the wings and see their throats move as they lick up the nectar at about 13 licks per second. For us, hummingbirds are one of the great joys of the summer. Plant late blooming flowers, such as nasturtiums and Salvia "Lady in Red" and keep up feeders until hard frost for migrating hummingbirds. 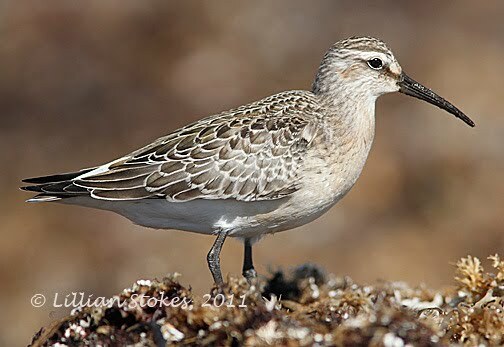 Curlew Sandpiper in NH, Yes! 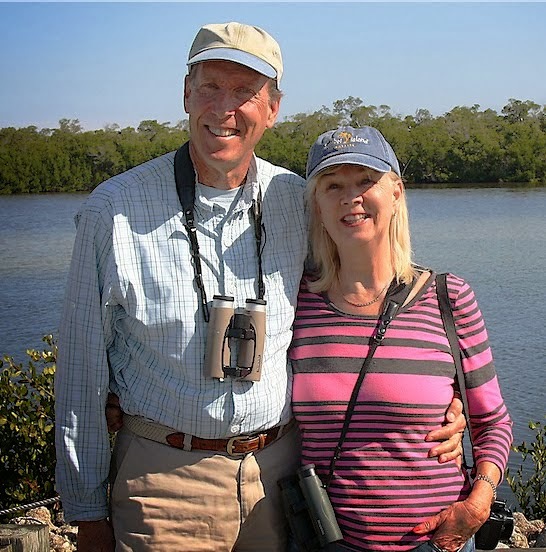 Chasing a rare bird is always an adventure. You never know if when you get there, the bird will be gone. The worst scenario is when you arrive and a bunch of assembled birders, who have just seen the bird, greet you with "you just missed it." So we were lucky when we went to the NH coast a few days ago, to find the rare Curlew Sandpiper, the bird was just where it was supposed to be. We had wonderful views and I got photos. Calidris ferruginea L 8 1/2"
Rare Asian vagrant to the East and West Coasts; casual inland. "Shape: Like Dunlin but with slightly longer legs and neck and a finer-tipped more evenly downcurved bill. Wing tips extend beyond tail tip; primary projection past tertials about as long as lore (Dunlin's wing tips fall short of tail tip, primary projection shorter than lore.) Ad. 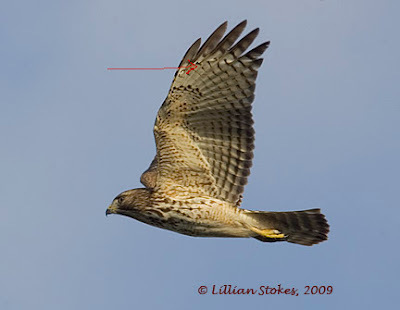 Summer: M. dark brick-red head, neck and underparts except for white undertail coverts with dark spots; white eye-ring. F. finely mottled black and white with traces of reddish brown on face, scapulars, and belly; whitish eyebrow. Dark legs. Ad. Winter: Unmarked gray above. Head, sides of breast, and neck finely streaked with gray and white; central breast usually clear; prominent whitish eyebrow (indistinct in similar Dunlin) contrasts with dark crown. Dark legs. Similar Stilt Sandpiper has longer and yellowish legs. Juv: (Jul. - Nov.) Upperparts grayish brown with fine buff margins to feathers, creating scaled appearance. Breast with buffy wash and some darker fine streaking along sides. Dark legs. Similar Stilt Sandpiper has longer and yellowish legs. Flight: Bold white wing-stripe; white rump, gray tail. Toes project just past tail. Hab. Wet tundra in summer, mudflats, beaches, shorelines in winter. Voice: Rapid burst of ch'd'deet ch'd'deet given on breeding grounds. Subspp: Monotypic. Hybrids: Sharp-tailed Sandpiper (hybrid called "Cooper's Sandpiper"), Pectoral Sandpiper (hybrid called "Cox'x Sandpiper"). We have more information in our new guide and we're proud of it. A birder needs extensive information when a bird like this shows up in his/her area to aid in ID. 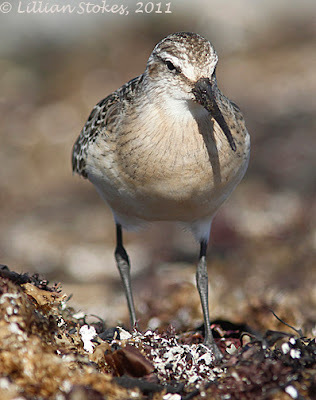 Will you be ready to ID the Curlew Sandpiper? On Sunday, 9/18/11 we, and many others, were at Pack Monadnock Raptor Migration Observatory, run by NH Audubon, to witness their historic, record-setting, hawk migration flight. We had 5,290 raptors migrate over our heads, almost all of them Broad-winged Hawks. 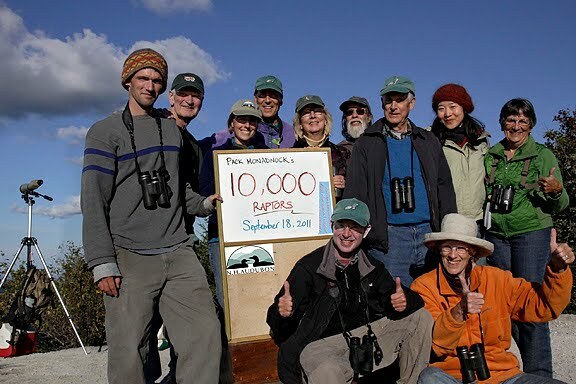 This made the season's total of migrating hawks, so far, to over 10,000 raptors, thus hence the sign and happy faces. It was awesome! Broad-winged Hawk, adult. Thousands glided by overhead. Broad-winged Hawks migrate in groups, riding thermals of warm air, then gliding to the next thermal, as a way of conserving energy on their long journey to their wintering areas in Central and South America. A rising group of Broadwings is called a "kettle". One of the kettles we saw contained over 1,000 hawks. The hawks peel off at the top of the kettle and ride to the next one. At one point we all stood in awed silence as many hundreds glided right over our heads, just filling the sky. It was such a powerful and emotional sight, of all those hawks, driven by instinct, going together on their perilous migration journey. 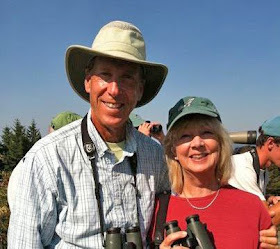 We have been watching migrating hawks each fall for over 30 years. It's a wonderful addiction, which, as someone on the mountain said, "there is no cure". 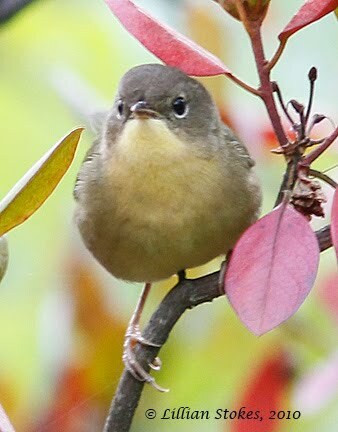 One of the fall migrants in our garden recently was this Common Yellowthroat, f. , peeping from behind the fall foliage, a usual move from this skulky, don't-let-the-photographer-get-a-full-body-photo little warbler. Get to know this bird well. It's a common migrant. Note the pale eye-ring, brownish cheeks contrasting sharply with the yellowish throat, buffy yellow breast. Not visible is the yellow undertail coverts. A 1st winter male would begin to show a little black on the face, the beginning of what will become his raccoon mask as an adult. Common Yellowthroat adult males are bright yellow with a raccoon-like mask. This warbler breeds across much of North America in dense, brushy areas often near water. 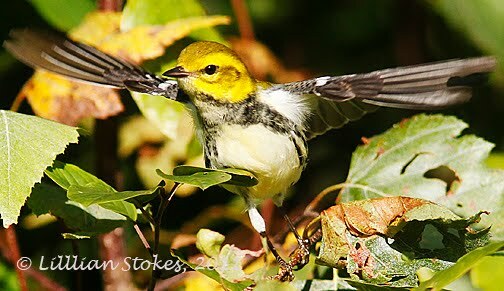 Warblers and hawks are migrating big time now. Broad-winged Hawk, adult. Has thick, black-and-white tail bands. The hawks are coming! The hawks are coming! We're entering prime hawk migration time for birders in the northern and eastern half of the U.S. 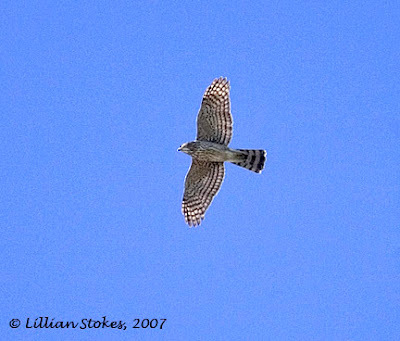 Some hawks, such as Sharp-shinned and Cooper's Hawks, Merlins and American Kestrels, will move by flapping, but Broad-winged Hawks, an abundant migrant, travel by using rising thermals. Weather conditions of clear and sunny, with mild north or northwest winds, should produce ideal conditions for Broad-winged Hawk migration. Most of the northeast hawk-watch sites will seen many Broad-winged Hawks this fall. 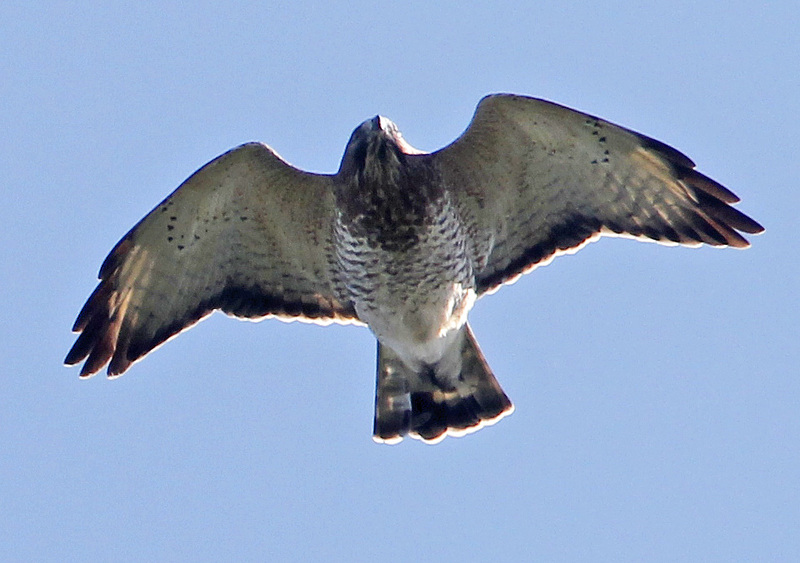 There are still many more hawks to migrate out of New England, so plan on looking. 1. 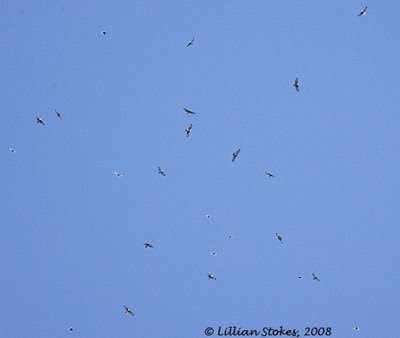 Prime Broad-winged Hawk migration in the North is Sept. 11 to 25, in the South (TX) it is Sept. 25th to Oct. 10. 2. Prime Sharp-shinned Hawk migration in the Northeast is Sept. 1 to Oct. 10, in the Mid-Atlantic States it is Sept. 10 to Oct. 20, in the West it is Sept. 11 to Oct. 31. 3. Hawks usually move most under sunny skies with mild northwest, north or northeast winds. 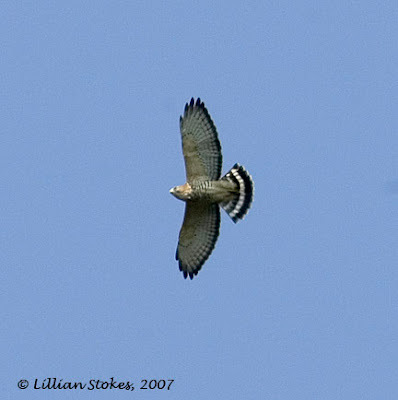 Broad-winged Hawks require thermals to move. 4. Go hawk-watching at one of the many "official" hawk-watch sites here. Or find your own by going to a hill, mountain, or tall structure available to you that has good views to the north, because that is the direction the hawks are coming from. 5. Bring binoculars that are at 8 power, or even 10 power if you have them. Scan slowly back and forth across the sky at different heights to find the hawks. 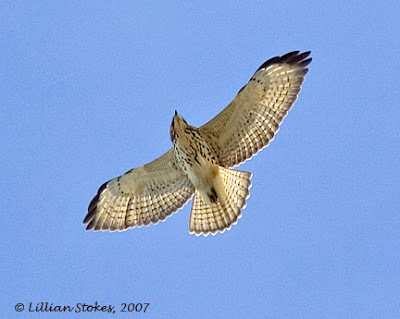 Most hawks will be fairly far away and some may look like specs. 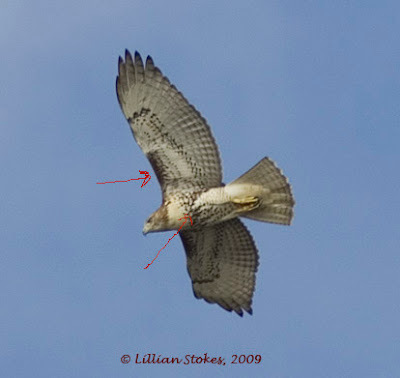 Learn hawk shapes at a distance to identify them. * Broad-winged Hawks. These are medium-sized hawks, 16" long, with broad wings, and soar together in groups. Look for the broad black-and-white tail bands seen on the adults, usually visible even at a distance. 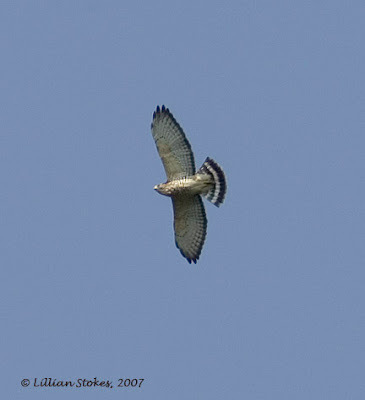 Juvenile Broad-winged Hawks have thin tail bands and dark streaking that is usually heaviest on the sides of the breast. * Sharp-shinned Hawks. These are small, about Blue Jay-sized, 12" long, hawks in the accipiter group. They migrate mostly singly with flap-flap-flap glide flight and have short rounded wings and a somewhat long tail that has a squared end. * Cooper's Hawks. These are extremely similar to Sharp-shinned Hawks, and are a tricky ID challenge, but are somewhat larger, 17" long, with a longer, rounded tail and larger, longer head and similar flight pattern. 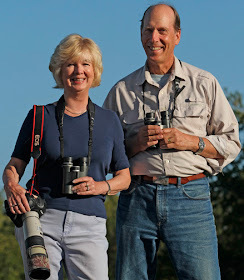 * American Kestrels. These are a type of falcon. 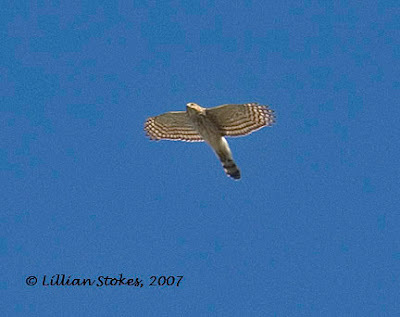 They are smaller than a Sharp-shinned Hawk, about 10 1/2" long, with pointed wings and a long tail and fly mainly with continuous flapping. * Merlins. Very similar to a Kestrel but darker and larger, about 12" long. 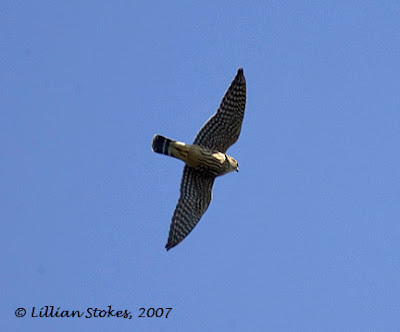 Has broad, pointed wings and a somewhat shorter tail than a Kestrel. Flies swiftly and strongly. 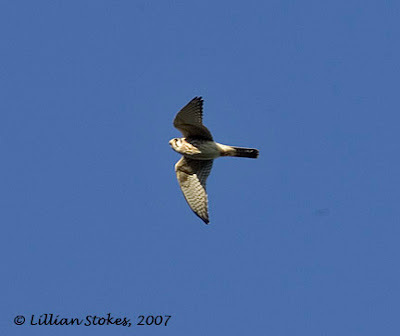 See yesterday's blog entry for details on Merlin vs. Kestrel ID. 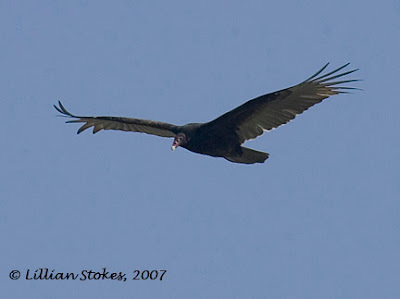 * Turkey Vultures. Very large, about 27" long, all black birds that constantly soar with their wings held in a V.
7. Keep track of your numbers and turn them in to your local bird or hawk-watching organization. 8. 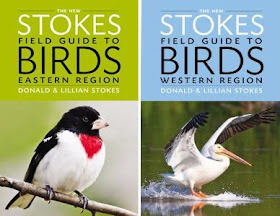 For more complete information on identifying hawks see our all new national photographic guide, The Stokes Field Guide to the Birds of North America. 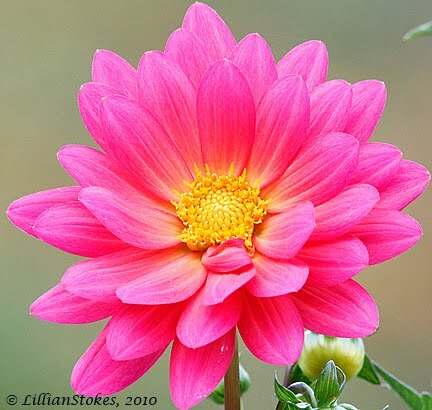 It has 3,400 images and is the most complete photo guide available. It ain't easy to ID juvenile hawks. It ain't always easy to indentify adult hawks either, but that's another story. We had posted a photo of a juvenile Broad-winged Hawk in flight and one of our blog readers asked if it wasn't really a Red-tailed Hawk juvenile. So that prompted this post. Here are some of my photos of juvenile Broad-winged, Red-tailed and Red-shouldered Hawks and their differences. 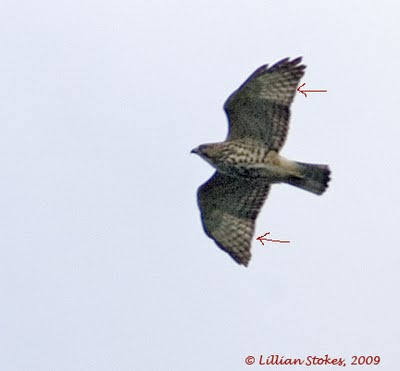 The juvenile Broad-winged Hawk is variable. The above bird is lightly streaked on the flanks and belly. It has a has a thin center stripe on the center of the throat (in some cases the throat can be all white). The underwings have narrow dark bars on the primaries and secondaries, dark tips to the primaries and a hint of a dark trailing edge to the wings. The tail has numerous dark bands, which may be narrow, or thicker, with a dark band at the tip. This is a darker individual with more heavy barring on the underparts. You can see rectangular pale panels on the underside of the wings, more visible when the bird is backlit, as here. Here's a Red-tailed Hawk, juvenile. Note the dark mark, called the patagial bar on the leading edge of the wings, a great ID clue. 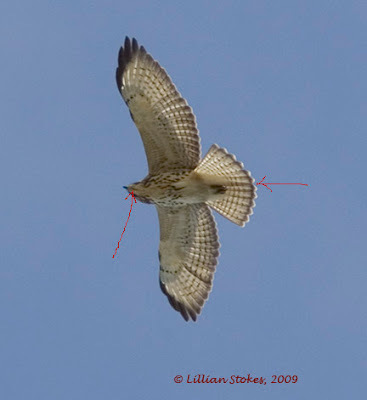 The throat can be white or, on more heavily marked birds, have narrow streaks. There are scattered dark marks on the undering coverts, sometimes looking like a comma. There's a white unmarked breast. The dark belly streaks form a "belly band," another great ID clue. There are numerous, dark, thin tail bands and there may or may not be a wider band at the tip. Here's another view of the same bird. You can see the belly band, and dark patagial mark on the leading edge of the wings. 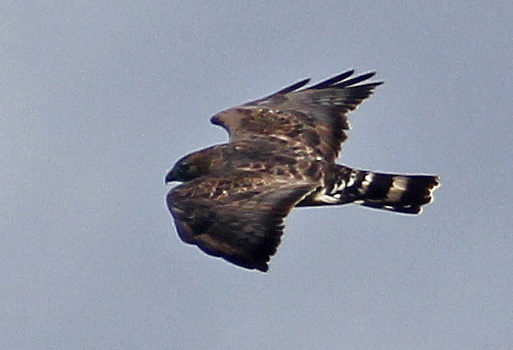 Juvenile Red-tails have a large pale panel on the outer edge of the upperwing, seen from above. One of the distinguishing marks is the pale, tawny, crescent-shaped mark on the outer edge of the top of the wing, showing clearly in the above photo. This can also look like a translucent crescent when viewed from below and backlit. 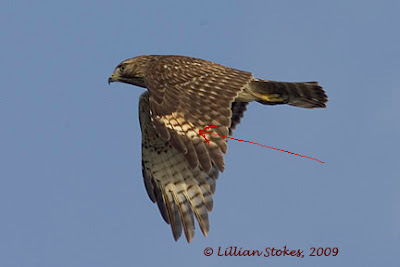 This is very different from the rectangular panel on the wings of the juvenile Broad-winged Hawk, or the rectangular panel on the Red-tailed Hawk seen on the top of the wing. 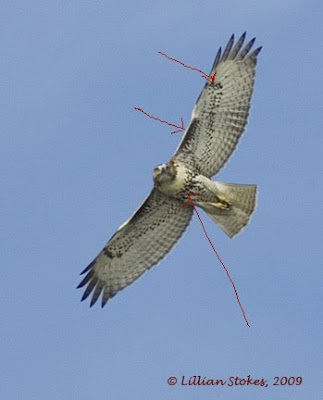 The wing crescent is slightly visible on the underwing in the above photo. The breast, belly and flanks have dark marks. Throats can be white with a middle streak, or have more streaks, or all dark with a white edge. 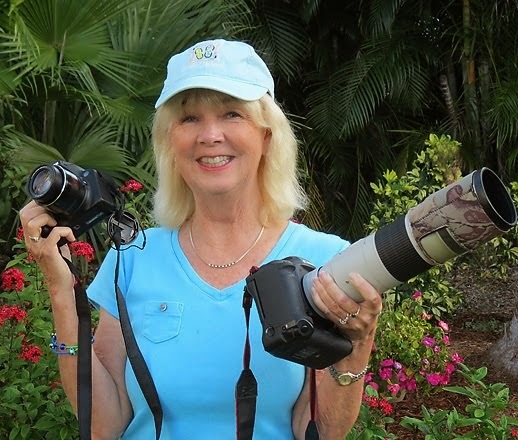 As we said, it ain't easy, but looking closely at birds and photos helps you see new things and prepares you better for the next time you're birding and encounter these birds. 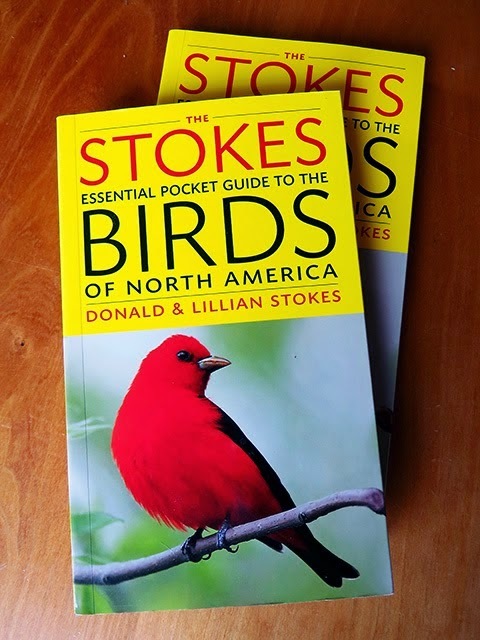 For further, more detailed information about hawks see our new field guide, The Stokes Field Guide to the Birds of North America. Photos of Broad-winged Hawk and Red-tailed Hawk taken in the Northeast in Sept. Red-shouldered Hawk photographed in Florida in Jan.